starring William Shatner. Yes, that William Shatner. Foodie trends are interesting, aren't they? Remember "blackened Cajun" everything? So big in the 1990s. Now? Not so much. High-end burgers will probably be next to go the way of fern bars, Chardonnay, and Green Beans Almondine. To help prevent future cooking-related fires, State Farm did something else (other than release the above stats). They hired William Shatner to tell his harrowing tale of nearly being immolated in a turkey frying incident. Have you ever tried to fry a turkey? Or know anyone who has? This is certainly a cooking method I'd like to "boldly explore" one day...before I reach my final frontier. :) Have you wanted to try it? Leave a comment below. I'd love to know your turkey-fryer thoughts. As for today's recipe, I have two for you that might come in handy this week and (you'll be happy to know) neither one involves a fryer. My first recipe is one I've shared before. It's in our Recipe Index, but many of our new followers may have missed it. I throw this pot pie together every year on the weekend after Thanksgiving. It's quick and easy, very delicious, and makes good use of your leftover turkey. If you're still looking for an impressive (yet easy) dessert to serve to guests or bring to a family gathering, here's one to consider. 3 contests and some happy publishing news. Ha! I'm shocked, *shocked*! that the South doesn't feature on that top 10 list more than it does. I talked to a man just Saturday who is deep frying his turkey! 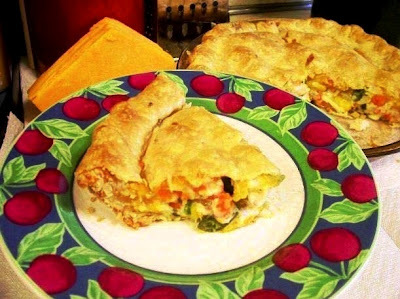 Thanks for sharing the Shatner (he always makes me laugh) and for this great pot pie recipe, Cleo...it's a winner! Oh, my! I've never tried it because I have a morbid fear of hot oil (channeling a medieval ancestor?). That's for Fryolators in restaurants, thank you very much. But William Shatner is a national treasure (if Canada will let us borrow him). 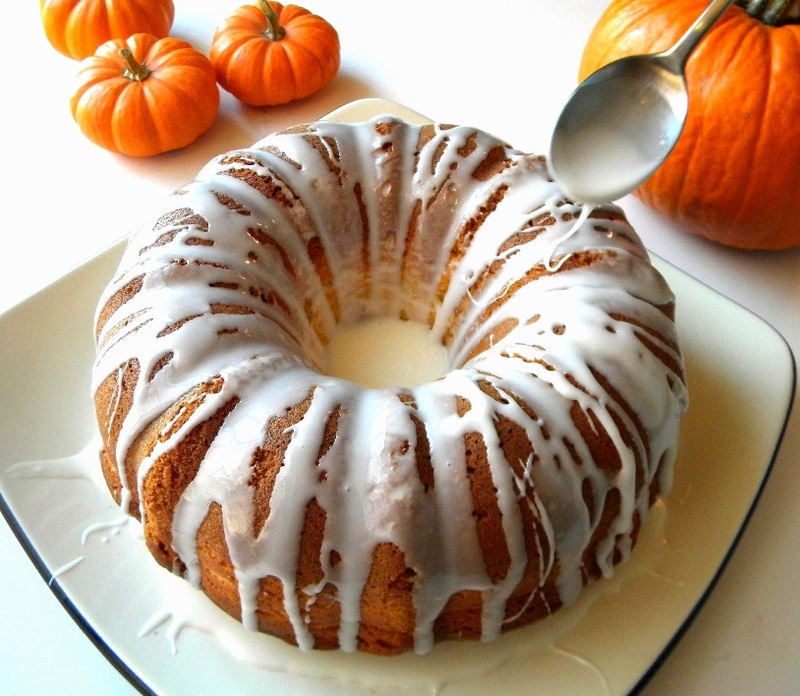 But the bundt cake looks great! I've never fried a turkey, but we are friends with a couple who never uses anything but a fryer for a turkey. They've had an incident or two involving the fryer and an inquisitive dog. The bundt cake looks wonderful. Maybe I'll try it and take it into school next week. Loooove the Shatner video. Thanks for making me smile! 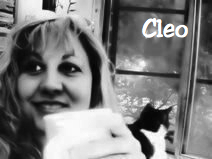 Cleo, I've heard about all these accidents, but wow! Fire, fire! Love the pumpkin dump cake. I love dump cake (I make it Gluten-free), but with the pumpkin for the moisture? Terrific! Avery - would you share your gluten free version? My principal's daughter has celiacs and I'm working on a basket of baked goods as a Christmas present and looking for gluten free recipes so that the whole family can enjoy. I actually went to Wally World and bought a bundt cake pan just to make this on Thursday!!! I have had friend turkey but I will stick with the one Les makes in his Weber grill...juicy, succulent and with lots of crispy skin!!! Kudos to William Shatner for always making me chuckle and you Cleo for always giving me a rumbly in my tumbly!!! Blessings to you and Marc this Thanksgiving! I have never fried a turkey, either. I'd like to try one once. People say it's the best! I'd like to try a Turducken one day, too. @Sheila - Thx for the nice words and I couldn't agree more about our dear Bill Shatner. North America is not alone in adoring him. I think it's safe to say he's a global asset! @Booklady - The "inquisitive dog" brings up an excellent (and very serious) point. My goodness, family pets should be kept far, far away from any outdoor turkey fryer. Good safety tip...and thx for the nice words on the pumpkin Bundt. If you try it, I hope you enjoy it. 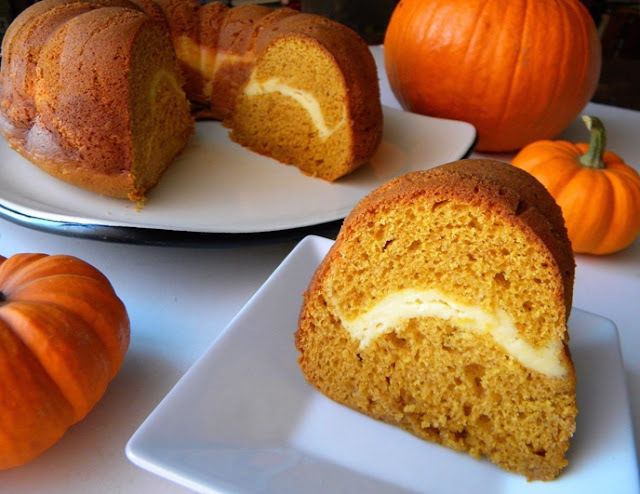 My husband does not like pumpkin but he loves this cake and that says a lot for its general appeal (I hope, anyway). @Barb - Aw, you are very welcome! Mr. Bill has the greatest sense of humor--hard not to love the guy! @Booklady - Avery has some wonderful gluten-free recipes in our index. Be sure to check those out, too. I will say, however, that for the first time, we bought an indoor *electric* fryer. I just get so very freaked over safety every year, and thankfully this year Hubs agreed. We bought the Masterbuilt Butterball Indoor Fryer (just search for that on Amazon, didn't want to look spammy!!). I can't wait to see how it turns out. We have fried turkey and the hardest part is making sure you just the right amount of oil. Then we found out about a fryer that uses no oil. It is the Big Easy by Char-Broil. IT works great and no oil, love it. Still get nice fried turkey without the troubles of suing oil. Someone in my family had fried a turkey for a number of years now. It does make the turkey taste a bit differently and sometimes they inject the turkey (no idea how this works) with a flavor that really kicks it up a notch. It's always quite good, I'm just too accident prone to go too near it myself, let alone try it. My son-in-law has deep fried their turkey foe several years. He's never had a mishap and the turkeys are really good with very moist breast and crackling, crispy skin. I would never so it, though. I love now that William Shatner is older he will do anything , anywhere. And yet I stil love him! That was a very important and useful video. I have always wanted a turkey fryer and may still get one but DANG I will be careful and read all the directions and USE the dingle dangle too.